Log in and Start Dancing! An Online Instructional Video Series featuring ex Cirque du Soleil Fire Dancer & Dance-based Fire Dance pioneer Srikanta Barefoot. From basic to intermediate techniques, the series is a stand-alone tool for both beginners & experienced fire artists alike. 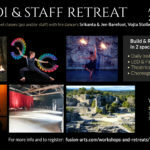 Boasting 165 minutes of Video, 16 Instructional chapters, 4 choreography segments plus interviews & performances of top fire artists from around the world, Dancing with the Fire Staff is an endless source for learning & inspiration. Just as there is no CD when purchasing music on iTunes nor a book when purchasing literature through Amazon’s Kindle, there is no DVD when purchasing Dancing with the Fire Staff. The decision to release the product in digital form only is made in consideration of the environmental impact of printing & shipping. In addition to making the right choice for the planet, customers enjoy zero shipping costs & instant access to the series worldwide. As a Martial Arts Teacher of 35 years, I’m impressed with the tremendous knowledge that Srikanta possesses. His ability to communicate it on video is fantastic. Been after a set of good quality staff tutorials for a while and the price is an absolute bargain considering it is a complete tutorials series from beginner to intermediate from a Cirque Du Soleil Artist. What is missing from tutorials I’ve seen are the choreography and stage presence elements that you go through in the DVD. But before this gets too long I can’t say how highly I recommend this to anyone and everyone. I bought your dvd reviewed it all- Great presentation, much to train with. Your inspirational interviews provide many insights into what i need to consider. I knew that I have little interest in twirling a stick with a bunch of tricks thrown in and this provides a valuable context in which to learn techniques with the intent of making dance. Bought the DVD ages ago. Absolute bargain. Ask yourself how much you would expect to pay to get lessons from a Cirque du Soleil level performer? The choreography sections are my favorite. It extends beyond just being technical. Great work Srikanta! That’s a really excellent thing! Thank you Srikanta for providing us with instructions on how to dance with the fire staff- not just simple fast spinning. Great job! “This video series represents the teaching which I’ve refined over more than 10 years of instructing staff. In addition to being a stand-alone technical resource for absolute beginners to intermediate and beyond, it provides students with the tools to continue learning & discovering independently.